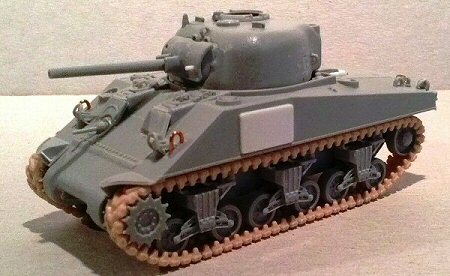 The kit is composed of six grey plastic moldings, the two hull halves, the soft plastic tracks and a large PE fret. The details quality is really good. The kit has the periscopes and the brush guards both in plastic and as PE parts (!) and the periscopes have also their little hatch (!!). There is also a metallic towing wire. Another peculiarity of this kit is that it gives us a lot of useful spare parts. There is the option between two transmission covers (cast pointed and bolted); there are also two spare rear plates (one is suitable for the Lima or the PCF production M4A1 and for the Baldwin production M4. 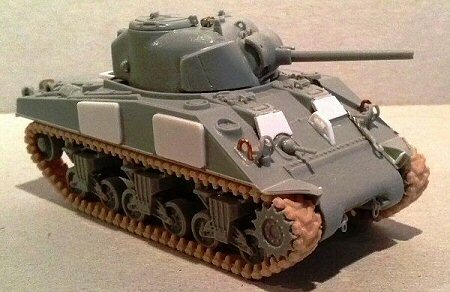 The other one is for the M4A4), an option between M34 and M34A1 mount, M4A1 fenders and other smaller parts. 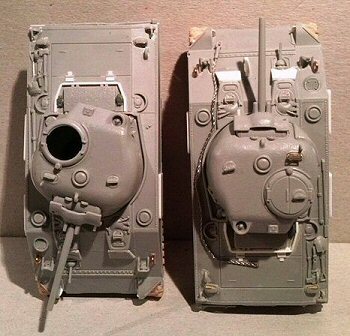 The tank proposed has the correct features of an early-mid ALCO tanks (see the antenna bracket) if built with the pistol port/appliqué armor turret and the bolted transmission cover. The mid production tanks had the rounded cast cover, easily available reworking the cast pointed supplied by the kit. For a late production tank with the kit cast pointed cover no pistol port turret is needed. The Pullman Standard hull was identical, but had a different antenna bracket type. See here. The kit can also easily be converted in a PSC tank. At first glance, I thought this was the definitive M4 Sherman kit, but when I begun to check it (I found it dimensionally correct) I had to admit it wasn’t. Being still a superb kit, it hasn’t the deep wading provided like an option. The engine deck part of the device is molded on the upper hull. This is not the real problem. The problem is that the device proposed in the kit doesn’t match the photographic evidence of the original I’ve found. The engine deck molded box is small (it should overlap the splash guards around the air intake) and the rear PE device is both small and wrong: the lower part should be rounded and comprising the engine access doors (compare with the photo). If you like the deep wading device, you have to get a look at the Heller kit, after markets items or use plasticard and scratch build it. I choose to reconvert it to a normal tank, an easy job. • The engine deck deep wading box was carefully erased. A 7.0 x 14.0 mm rectangular base for the engine air intake cover was made with 0.25 mm plastic. • On the engine deck rear there are two little holes to fill with a drop of cyanoacrylate glue. 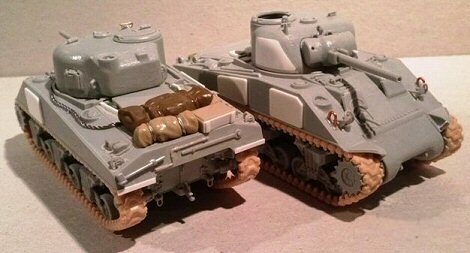 They are the placeholders for the 17 pdr gunlock on the Firefly Mk I. • Two reservoir caps were taken from an UM spare engine deck and glued at the sides of the cover and I made the splash guard with 1.0 x 0.50 mm plastic rod, following the photos you can see here. • I’ve added some surplus parts provided by the kit (the engine air intake cover and the exhausts, not needed on a tank equipped with the deep wading kit), since they are very well done. • The missing hinges were added with four 0.25 mm plastic little pieces and two thin stretched sprue segment. • The bow lifting points are thin and I made new ones with metallic wire. • The hull appliqué armors surfaces are rounded and a bit thin (0.20 mm) and don’t look realistic. I made new ones with 0.50 mm plastic adding also the thick welding with glue. You can find the right dimensions of these plates here. • The bow appliqué armors also look thin. I shimmed them with 0.25 mm plastic on the back side. The huge welding seams were also added. • The siren is present on the mould but not in the instructions. It is of the first type mounted on the left fender. 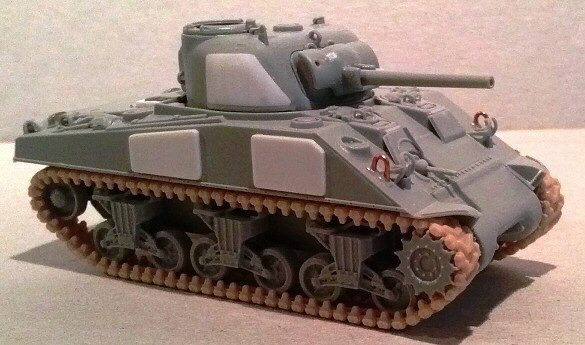 A later type with its guard was scratch built. • The structure on the inner side of the fenders was made with 0.25 m plastic. • The turret appliqué armor looks right, but when compared to pictures, it hasn’t the right shape. I corrected the rear side (which must be vertical) and the upper side (should be straight). See the same references above. • The idler pins on the track tension systems are too short and the joints are weak, being the idler interlock hole not deep enough. New stronger ones were made to line up the idlers to the wheels line. • The bogies are well done, but the wheels (which are of the stamped type and well done) are molded on them and all in the same position. No option for an open spoke set is provided. This could be a problem; anyway aftermarket sets are available as well as extra sets in the Trumpeter or Heller kits. • I erased the pistol port. • The cast-in armor was added with 0.50 mm plastic. • 70th TB C-2 “CANNON BALL” in Normandy: it was an ALCO tank and the markings are correct; according to the preview the tank had the supports for the multiple rockets launcher (missing in the kit). In both photos I’ve seen the transmission cover was not visible. The Dragon instructions gives this vehicle a cast transmission cover. However the serial 3066192 was the 208th tank of the 2nd batch and was be produced in April 1943. If I’m right it's highly possible it had a bolted transmission cover. For sure it had the pistol port (it had the appliqué armor on the right side and they are aligned) and the glacis horn. See here too or here. The bumper codes 1A70? and C-2 are missing. 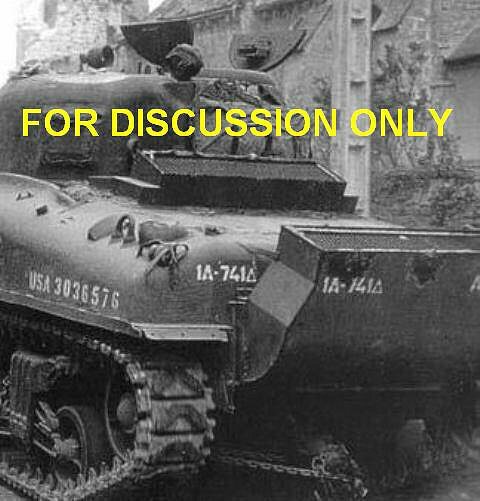 • 4th AD 37th TB HQ “TONTO” in Normandy: the only photo I’ve found show it with the open spokes wheels, the serial is not visible but anyway the antenna bracket looks to be the type used by Pullman Standard. The serial 3025405 proposed in the decal set (and also in other sources) lies outside the range of known Pullman Standard serials (3036xxx and 3039xxx batches). I don’t know its individual number, anyway “T” names belonged to the HQ section and its tank commander, Capt. William Dwight, was the 37th TB S-3 or operations officer. Tonto had the cast transmission cover (in the photo it seems to be rounded, not pointed) and the pistol port; no glacis horn is visible so possibly it was on the fender. The bumper codes 4?37? and HQ-__ are missing. • 756th TB C-14 in Italy: I’ve only seen one photo of this tank (it is quite known and easy to find) where it appears without the serial number, but showing the sloped rear upper plate for an ALCO or a Pullman tank, which is correct for this kit. No hull appliqué armor is needed for sure, the turret one is not visible due its position. In my opinion, although it has the deep wading set incorrect and the fixed wheels set, I think it is still a very good kit needing very few detailing jobs after having corrected the deck. Of course, to solve the kit's problem everybody can choose other options, like using an engine deck from another M4/M4A1 kit or use a correct deep wading set (as already said). 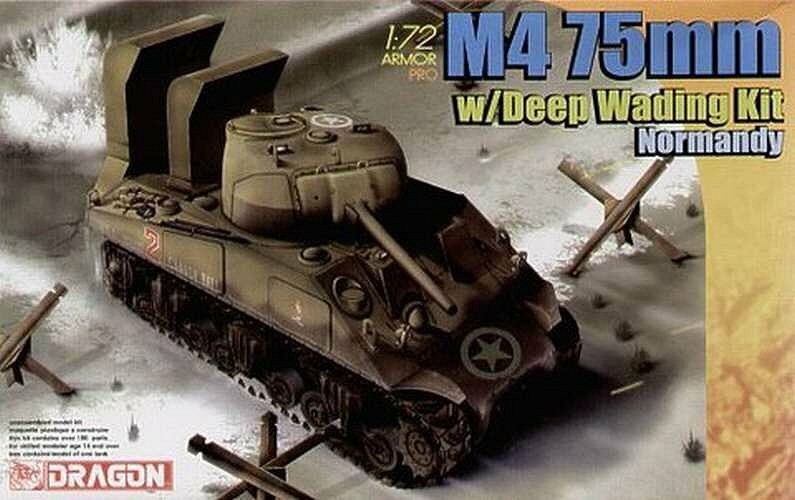 If the wading trunks had been provided as an option to a normal deck it would be the best M4 actually on the market, being really very detailed.